I’m going to say this right off the bat: the first season of HBO’s Westworld is the greatest thing that has happened for television since the first season of HBO’s Game of Thrones. Both share some commonalities - they’re the product of a company that has an uncanny penchant for nudging the bar of quality TV up a notch every few years. But they also share a knack for digging deeper into their selective settings than initial impressions might imply. To all but the fans of George R. R. Martin’s book series, Game of Thrones was going to be just another attempt at a swords n’ sorcery fantasy epic - a glorified rip-off of Lord of the Rings, or *gasp* Xena: Warrior Princess - until its immediate focus on warring families, morally grey characters and deadly deception captured viewers by the millions. Westworld is of exactly the same nature - on paper, it’s just a reboot of the cult 70s sci-fi movie of the same name, just with a modern gloss to ensure it appeals to a contemporary audience. It will no doubt be far less kitschy than the original’s tale of a machine uprising on an amusement park, and it will no doubt be injected with the standard suspense and drama typical of any of HBO’s other big titles. And it will no doubt have some recognizable big names for cast members too. They got Anthony Hopkins in for a role. Brilliant! Ed Harris - sure, why not? HBO has the budget, after all. Evan Rachel Wood, James Marsden.. yep, they got some really good, experienced acting talent in here. Should be a good series. I’ll make sure to DVR it. Because, let’s be honest - it’s not as though we live in an age that is completely unaware of its relationship with increasingly intelligent technology. Ex Machina came out not too long ago in theaters, and a certain movie called The Terminator happened quite a few years before that - we’re more than aware that our own eventual armageddon is going to come through a perfect, digital creation of our own making. On description alone, Westworld is just another show detailing the dangers of sentient artificial intelligence, and even its first two episodes - while unquestionably excellent from a technical viewpoint - don’t deviate much from that formula. It’s happy to cling to its source material, for better or worse, and expects the viewer to be wowed enough by their incredible production values to appreciate their setup. 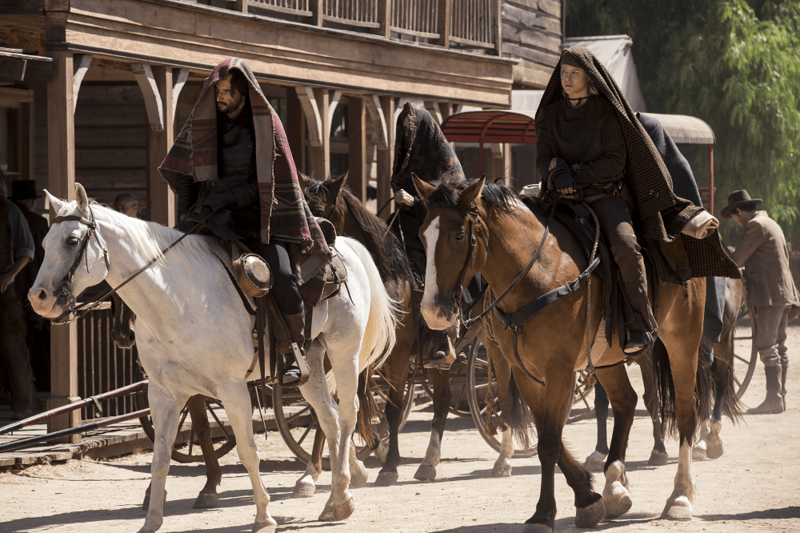 Fast forward another episode or two though, and Westworld is no longer solely about the obvious robot revolution it steadily begins to unravel - though that is still a key component. But its bigger questions - those regarding the boundaries of human identity and what the individual consciousness we each take for granted actually entails, especially when we try to replicate it within a machine - are now tantalizingly dancing right in front of us. To our surprise, we realize that they were always there in the show’s early chapters, all along. We just didn’t notice the subtle dropping of them into the dialogue, the subtle clues in the occasional character gesture or camera shot. 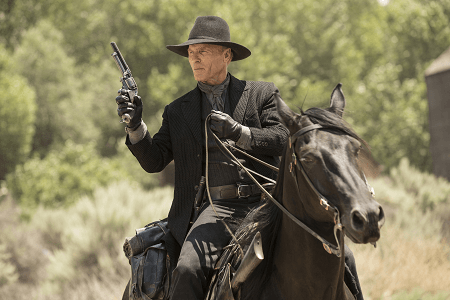 Westworld’s wide array of heroes and villains may have their own tales intermingled within opposing sides of a struggle between man and technology, but each of them is like a tile in a mosaic, joined together piece-by-piece, to reveal an intricate pattern only fully seen and understood once the show reaches its stunning climax. This pattern might detail yet another perspective on just what the unstoppable advancement of computer science really does mean for us. But rarely is it proposed that the perfect nemesis we’ll inevitably create for ourselves could conquer us while at the same time questioning the nature of existence themselves. 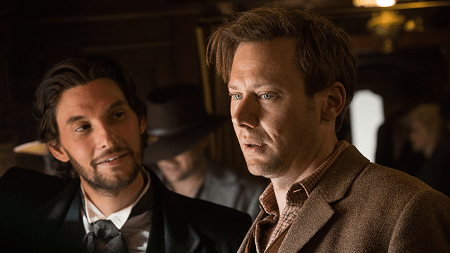 Rarer still does such ambitious philosophizing realise itself so flawlessly in a TV show - but Westworld, contemporary, deliberate and ingenious with its world-building, achieves this feat quite brilliantly. It’s the near future, and a rather well-off corporation has spent their cash building a sprawling theme park for adults, centered around a Wild West theme. They’re now busy making back that money by charging ridiculous fees from the rich and wishful who, in exchange, are granted accommodation to stay and roam around its seemingly limitless landscape, interacting with its inhabitants - manufactured, AI-driven androids called ‘hosts’ - and doing pretty much whatever they want. Naturally, social commentary trope or otherwise, these rich folks waste no time letting their true natures show once on-site - murdering, griefing and abusing such automatons who, after all, exist simply for their pleasure. An unnamed man, dressed entirely in black (Ed Harris), is roaming the park’s wilderness doing exactly such things. Another pair of visitors, the cocksure Logan (Ben Barnes) and his markedly more reserved future brother-in-law William (Jimmi Roberts), are also on site with plans - at least in Logan’s mind - to partake in similar entertainment. And all of this is okay, because their targets are robots - cold, programmed vessels devoid of memory and self-awareness. It’s not like they’ll remember any of the god-awful things that happen to them, once they’re carted off for repairs and a little fine-tuning. But of course, they do - this is very much a show where the viewer is shown, rather than told, about each character’s motives and struggles, and this focus is very often placed on Westworld’s main attraction - the AI hosts themselves. Subject to the orders of the park controllers - and the mercy of the park’s customers - they only experience a semblance of an existence when they are switched on and operating, and thus have a model of consciousness to match. No greater portrayal of their designed role is shown than in the series’ very first scene, where one such host, Dolores (Evan Rachel Wood), is being interviewed post-maintenance session to check for any anomalous changes in her behaviour. Dolores’ programmed role is to be a rancher’s daughter - she lives with her parents, has a fellow host for a love interest (gunslinger Teddy Flood - played by James Marsden), and idealistically dreams of a life on a new frontier away from the prairies she calls home. But it is a dream - one of the disturbing variety - that she immediately exhibits extreme distress over as she is brought back online for the screening. In her own words and gestures, she’s legitimately terrified by it. It is only when her interviewer commands her to drop her character - go into ‘analysis’ mode - that the pivotal moment of this initial scene occurs. Her expression and personality neutralize immediately, and she responds to her interviewer’s questions in a far more generic, logical tone than the Western lilt she was exhibiting moments ago. Beneath her convincing display of emotions while in character, Dolores is ultimately still a soulless robot. 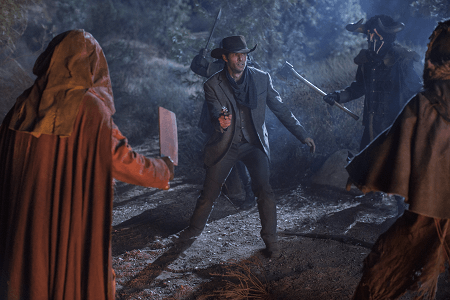 On top of this scene being a great early example of Wood’s diverse range in what is a challenging role, it’s also the show’s first demonstration of the blurred lines between reactive human and calculated machine that Westworld’s hosts continuously run along - a distinction that only becomes increasingly opaque as the show goes on. 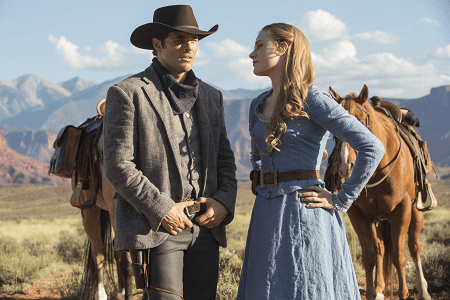 The show follows Dolores pretty closely in the opening chapters, running through her same programmed loop as she roams around the park’s central hub town of Sweetwater, while new events in her pre-defined script continue to emerge and change who she is. She isn’t the only AI beginning to remember events from previous cycles of operation either - Sweetwater’s self-assured, flippant saloon madam Maeve (brilliantly portrayed by Thandie Newton) is also suffering from a similarly jarring series of visions. The ambiguity over whether or not Westworld’s hosts are beginning to become self-aware is laid to rest pretty early on - after all, you can’t have a story about robots gaining sentience without them gaining a memory first. But it’s the hosts’ slow, steady realisation of what their existence entails - a repeatedly daily, unavoidable ritual of being violently murdered and even raped by the park’s visitors - which gives Westworld its crucial early pathos. The continued interviews between technical staff and host - Dolores’ in particular - only offer to deepen the suspense further. The hosts are certainly getting ideas of what the purpose of their existence is, so how much are they choosing to hide from the human controllers reviewing them after every repair? It’s not as though the humans of this stage are having a blast either. Within the heart of Westworld’s corporate control center, all is not well. Stakeholders are staging a silent war for control of the company, while senior staff express bafflement at the clear and obvious changes the park’s AI creations are displaying. Its surviving creative director, Dr. Robert Ford (Anthony Hopkins), also seems happy to passively observe these shifts in behaviour while his subordinate Bernard Lowe (Jeffery Wright), Westworld’s Head of Programming, is tasked with figuring out the reasons for these developments, and stopping them before the situation spirals out of control. 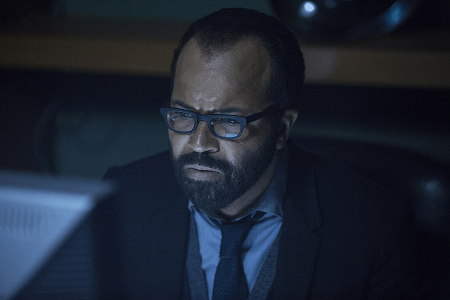 Bernard’s own personal arc begins, like many of Westworld’s characters’, in slow fashion - he’s initially diligent and driven in his interviews with Dolores and the other hosts, if little else. But as the search for truth begins to lead down a path that winds around some of the updates that Ford himself has programmed into them, as well as his early working relationship with deceased founding director Dr. Arnold Weber - an individual said to have died on the grounds of the very park they built - the show eventually turns to mirror back on to Bernard himself. 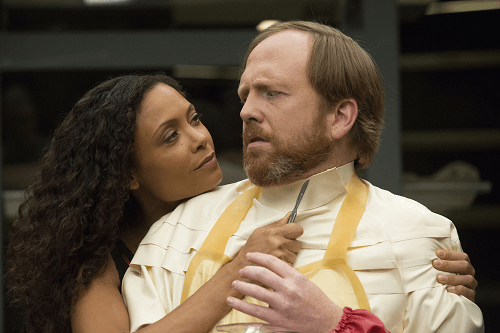 In the later episodes, he unquestionably transforms into one of Westworld’s most complex characters, even more so than the park’s gradually rebelling AIs. The reason behind such a transformation won’t be spoiled here - needless to say, it’s one of Westworld’s many momentous twists - but it is probably one of the finest character sub-plots produced for a TV show in quite some time, and is worth the viewing of Westworld alone. And then there is still Westworld’s riddle of identity - everyone is looking for one. Both Dolores and Maeve are trying to find the reasons for their unexplained hallucinations, the aforementioned Man In Black’s campaign of violence is really a means of trying to work out how the hosts really tick (even if it’s not initially clear whether he is human or android himself), and the relationship between park visitors Logan and William swiftly becomes a classic struggle between humanistic good or evil, and whether or not morals are a worthwhile endeavour once Man becomes truly free to do what he wants. Logan, having been to the park many times before, is more than happy to get back into his regular flow of amoral activities - which include rampant drinking, whoring and random acts of cruelty to the AI characters - than William is to take them on. William’s own initial impressions of the park’s illusory experience leave him uncertain of how to proceed - he is far more curious about the nature of the park’s inhabitants than how they react to abuse, much to Logan’s chagrin. 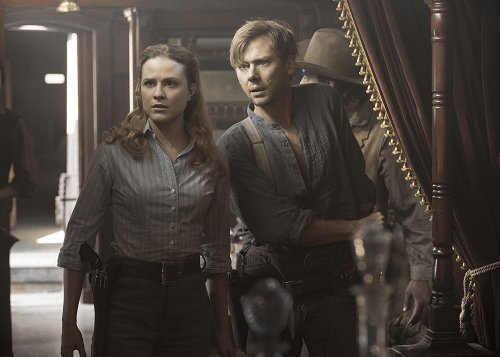 When William’s path inevitably crosses that of Dolores’, whom he initially meets while she’s doing her rounds in Sweetwater, both characters provide the catalyst for each other’s personal development. His own fascination with her leads him to question the nature of humanity itself, while she begins to realise that the key to her own internal phenomena might lie with him. Together, their arc forms the critical bridge Westworld needs to unite the numerous philosophies - technological, social and psychological - that it builds over time. Without such a sub-plot, Westworld would be just another cautionary tale of humanity becoming enslaved by machines. With it, Westworld achieves its ambitious goal of successfully conveying that even our own perceptions of consciousness could be a lie - and goes way beyond the depth of other productions attempting to tout similar messages. If I have gone on for too long about each of these individual stories, it’s only because Westworld treats them all with the same level of importance as each other, and each one most definitely has a key role in defining Westworld’s immaculately intricate whole. Eventually though, all of these different threads - multi-layered, overlapping, incremental in their flow - meet their ends, and all roads eventually lead back to the one character responsible for the entire park - Dr. Robert Ford. 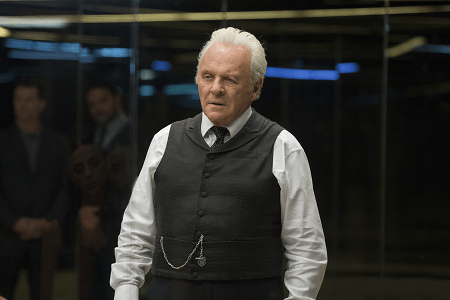 It’s no surprise that the most influential character in the entire series happens to be the guy played by its most prestiged cast member, and Anthony Hopkins absolutely delivers with a portrayal of a figure who is as tyrannical as he is charming, and as elusive as he is honest, about Westworld’s deep-rooted secrets and his own culpability in the hosts’ continued anomalies. It’s the kind of role he’s stepped into many times in his career, but thanks to a brilliantly-written script that offers him plenty of thought-provoking monologues to put forth, it is by no means a derivative one. In fact, Westworld’s machinations are at their most gripping when Ford is present in the picture. As his presence in the show grows toward the end, so too does the urgency for all of the show’s questions to be answered. And you know that he’ll be more than happy to answer them - just only on his terms. As arresting as Westworld’s conundrums about existence might be, they are all inevitably tied to the mystery surrounding Ford’s eventual goals for the park. It is not until the series’ incredible final episode that such goals are revealed, but it is also to the show’s credit that it constantly keeps you guessing to what they are. In amongst all of these ludicrously detailed yet comprehensive sub-plots, it’s also very easy to forget that Westworld is also trying to put on a riveting Western drama. It definitely looks the sensational part, with its characters often being mere foreground detail to the breath-taking vistas and rock formations that make up the park’s expanse. And the quality of the acting, which is simply stellar through the main cast, is also present among the show’s bit-part characters as well. It’s easy for us to understand just why the human visitors to this realm are so convinced by the bionic creations around them. 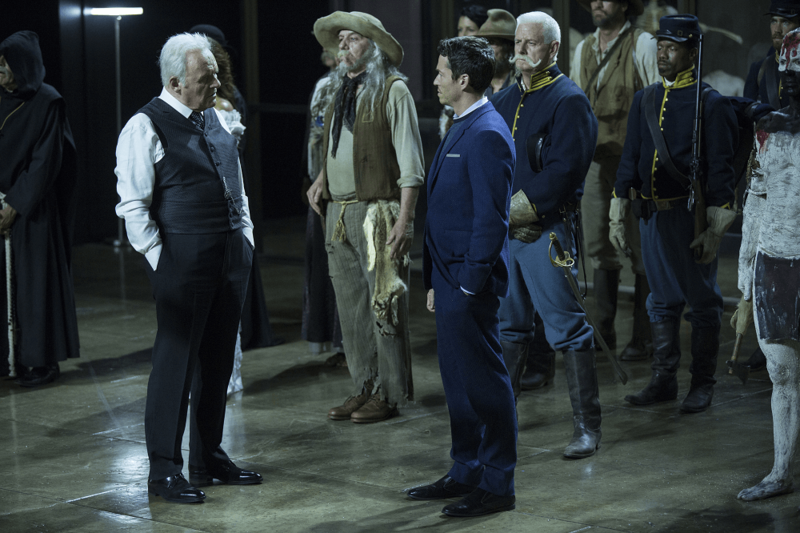 With the show’s numerous sets being just as mesmeric, the realm of Westworld genuinely feels like a living, breathing reality from a time long past. During Logan, WIlliam and eventually Dolores’ journey away from the park’s civilized center (the latter being certain that the journey will help her reveal memories of her past), the ‘wild’ part of this West most definitely gets emphasized as well. The further into the wilderness these three go, the more dangerous and savage their situation - and in the case of the human players, their mindset - becomes. It’s a change of tone that’s complimented well by their increasingly rugged surroundings, and is subtly reminiscent of Apocalypse Now - if only in how this journey, visually and symbolically, represents an eventual encounter with the human characters’ own primal lusts for power and control. And of course, it’s just another way that Westworld deliberates on the intricacies of our own condition, adding to a narrative that is already as deep and absorbing enough as it is. With so many points and counterpoints that Westworld needs to make about its subject matter - us - it’s barely surprising that its initial opening is so slow and cautious. It’s a deliberately ponderous start, one that builds into incredible measures of poise and passion as it reaches its monumental end. Such a pace is also prevalent throughout every other facet of the show too - a mere study of the show’s opening credits is proof enough. As its montage of AIs being pieced together on a production line runs alongside the image of a die-cast Vitruvian Man (Da Vinci’s own dissection of human design), an orchestral number driven by saloon piano slowly lurches into motion, before ending in a full, dramatic crescendo of flurrying strings and unsettling keystrokes. It’s a dramatic, emotive musical shift - one that is just as prevalent in its story, and in the characters whose changes in personality are finespun rather than immediate. It might just also be the show’s way of being remarkably meta, but it does cement it as being incredibly clever with its own self-references. When such symbolism is then coupled with a fantastic script, and equally fantastic performances from a cast who are clearly as passionate about this project as both its writers and emergent fanbase are, Westworld’s first season cannot be classed as just a smart show philosophizing about human existence. It becomes a work of art in its own right, and an incredible platform for its future episodes to build upon. Westworld is currently screening on the HBO channel, as well as all HBO streaming services.